Chappellet was created during the summer of love, that’s 1967 for those that don’t know, cannot remember, or are just too young to know. What happened was, Don Chappellet and Molly Chappellet moved from Los Angeles and purchased what was to become Chappellet Vineyards on Pritchard Hill. They chose the site in part, thanks to advice from the already legendary Andre Tchelistcheff. Aside from the initial person that gets credit for settling in the area in 1880, Thomas Pritchard, the Chappellet family were the first growers in the modern era to really cultivate the region. Because they were the first, they were also able to obtain the rights to using the Pritchard Hill name for their wines. At the time of their purchase, while a portion of their vineyard was planted to Cabernet Sauvignon, they had a much larger percentage of Chenin Blanc and Gamay in the vineyards. Those vines have since been removed. After purchasing their 50 acres of land, they began constructing a new winery in 1967. Because their vines were still young, they did not produce a wine until the following year, which proved to be good fortune indeed, as 1968 was a banner vintage for California wineries. The 1969 Chapellet is considered a legendary wine by fans of older, classic Cabernet Sauvignon. The architecturally interesting, pyramid shaped winery took a few years to complete. So their first few vintages were produced at neighboring wineries. Their first hire was naturally the wine maker for Chapellet. The brought in Philip Togni, who went on to create his own, self named winery. The Chappellet winery have always had good fortune when it came to choosing wine makers. Philip Togni was the winemaker for Chapellet when they produced their famous, 1969 wine. After Philip Togni, Joe Cafaro, Tony Soter and Cathy Corison were all tapped for the same job, before moving on to found their own estates. Fortunately, after Corison, they brought in Philip Corallo Titus, who has remained with the property for over 30 years! Since their original purchase, the vineyards have been expanded. Today, the Chappellet family own more than 100 acres planted with vines in the Napa Valley. However, their vineyards are only a small portion of their real estate holdings, as they are now of the biggest land owners in the region with close to 3,000 acres in total in their possession. Chappellet uses only self sustainable and organic vineyard farming techniques. In 2012. their Pritchard Hill vineyard eared its organic certification. 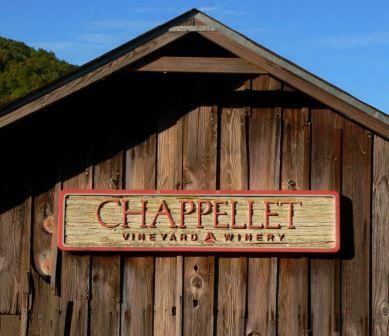 Chappellet is also one of the more environmentally, green estates in the Napa Valley. In 2008, Chappellet completed construction on their 20,000-square-foot solar photovoltaic system. That means that as of 2008, Chappellet is able to produce energy to offset their complete usage of electricity. Chappellet goes one step further in helping conserve water. They have their own water reclamation plant that allows them to reuse water for irrigation. The red wines of Chappellet are best served at 15.5 degrees Celsius, 60 degrees Fahrenheit. The cool, almost cellar temperature gives the wine more freshness and lift. Young vintages of their red wine can be decanted for 1-3 hours, depending on the character of the vintage. This allows the wine to soften and open its perfume. Older vintages might need very little decanting, just enough to remove the sediment. The red wine of Chappellet is best served with all types of classic meat dishes, veal, pork, beef, lamb, duck, game, roast chicken, ribs, hamburgers, barbecue, roasted, braised, grilled dishes and stews. Red Chappellet is also good with Asian dishes, hearty fish courses like tuna, salmon, mushrooms and pasta. The white wine of Chappellet is best served with all types of seafood and shellfish, sushi, sashimi, chicken, veal, pork and cheese. Aside from Cabernet Sauvignon, Chappellet also produces wine from Merlot, Cabernet Franc, Malbec, Petite Sirah, Zinfandel, Chardonnay and Chenin Blanc grapes as well as an entry level wine from a Bordeaux styled blend, Las Piedras. They have also recently added to their holdings with the purchase of Sonoma Loeb winery, located in the Sonoma Coast. Their top wines are all Cabernet Sauvignon based wines with their flagship wine being Chappellet Pritchard Hill. In addition, they also produce Chappellet Signature, and Donn Chappellet. Their wines are available for sale at local merchants and through their mailing list. With freshness to the fruits, ripe tannins, concentration and an aromatic profile of wet earth, herbs, spice and dark black with red fruits, the wine is a winner. Light in fruit and color, the wine is light, bright, dominated by red fruits and should be best when consumed on the young side. Forward, easy drinking, soft, ripe and round, with ripe blackberries, chocolate and licorice in the finish. This is a great example of California Cabernet that pairs ample layers of super, ripe berries with power, concentration and oak, yet does not come close to being over the top. Everything is in balance in this outstanding wine. Licorice, smoke, truffles, blackberries and earthy scents were in abundance with little effort. On the palate, the wine is soft, polished, round, lush and fresh, with a long, expansive, chocolate covered dark berry finish. Earth, oak, plum and cocoa scents lead to a fresh, crisp, high toned expression of Cabernet Sauvignon that ends with a cherry dominated finish. Soft, ripe, black and blue fruit, licorice and coffee with rich textures and a forward, ripe, fruit filled finish.